When you are buying new cabinets, you have to decide if you want custom, semi-custom cabinets, or RTA kitchen cabinets. There are reasons to go with any of these three options, but RTA cabinets are usually the best choice. Custom and semi-custom cabinets are thought of as the high-end cabinets. They tend to offer quality products with a lot of variety for a premium price. As their names should imply, Custom cabinets allow for a lot of customization while semi-custom cabinets allow a lot of change but not as much as the custom made ones. Semi-custom cabinets almost always cost less. There is, however, the third option. Ready-To-Assemble, or RTA, cabinets still make it possible to design your new kitchen with a lot of options and various cabinet sizes and functions. RTA kitchen cabinets are created in bulk and stored in warehouses. 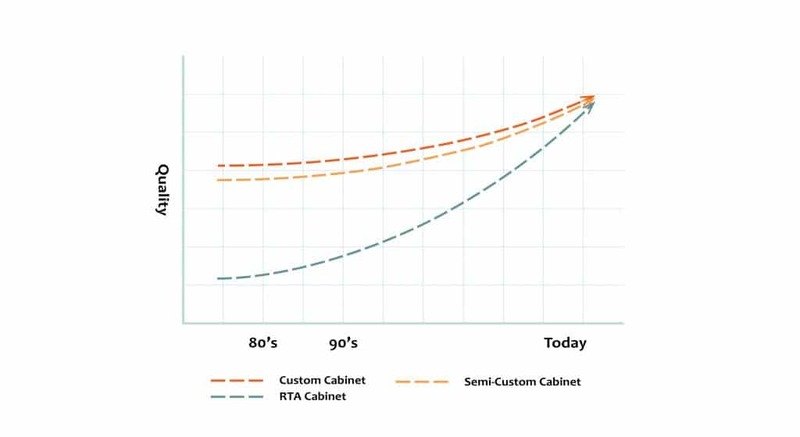 This means that the RTA cabinet prices are far lower than custom cabinets and you can pick them up right away. For many decades now the RTA side of the cabinet industry has been seen as the cheap option. Chinese imported cabinets were known as the low-cost-low-quality choice. This stemmed from the plethora of cabinet companies that made cheaper products that didn’t last long. However, this last decade has seen a magnificent rise in the quality of RTA cabinets offered by some companies. There are still imported RTA cabinets that fall pretty low on the quality spectrum but now there are also some RTA kitchen cabinets that rival the semi-custom or even custom made cabinet crowd in quality. Here at Cabinet City, we offer the highest quality in RTA cabinets. We have plenty of cabinet options for you to choose from. You will be able to find a look and style that will work for a kitchen that you will love. We encourage you to compare the quality of our cabinets to other RTA, or even custom cabinet providers. Cabinet bodies are constructed with 5/8” and 3/4” plywood, providing a stronger cabinet than the standard 1/2” plywood that most use. Full 5/8” plywood backs so you can hang your cabinets with confidence. You will be able to see the quality and craftsmanship in our full overlay doors. Doors on our painted options, like White Shaker, are made from one piece of solid wood. Many of our traditional style doors and frames are made from hard eco-friendly rubber tree wood. When we say “full overlay” we mean FULL overlay. The quality of our cabinet’s construction leaves mere millimeters of a visible frame around the doors. The quality you will find in our cabinets is better than any RTA company and as good as, if not better than, most custom-made cabinets. We may not have the same extent of choices when it comes to the varieties of cabinets but we have plenty of options. 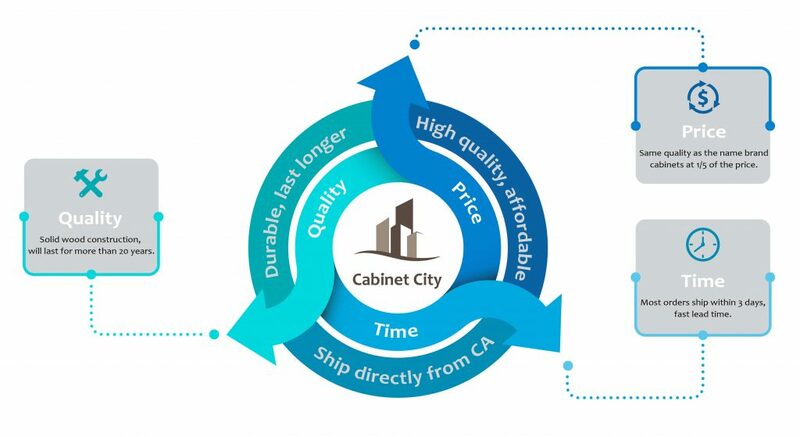 For all the quality that you will get from Cabinet City, you will pay a fraction of the price that custom cabinets would cost you. Our cabinets are often priced better than many of our RTA competitors who produce products that are clearly inferior to our own. On top of all that quality, our cabinets are stored right here in our warehouse, so there is no need for any 6 to 12 week waiting period for your cabinets. It is said that in “The Production Triangle,” that there is time, quality, and affordability; you can only pick two. Having all three is thought to be impossible. But not at Cabinet City!